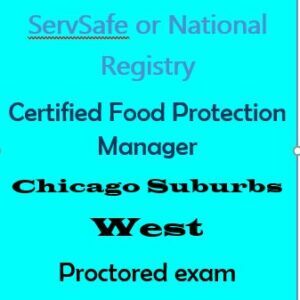 – beginning at 7:30 a.m. with proctored testing at 3:30 p.m.
Get your Food Protection Manager Certification with this 8 hour proctored food licensing course that meets conveniently on a Saturday. Certified Food Safety Programs will guide you through the process and proctor the test. The Ilinois Department of Public Health (IDPH) and the Chicago Department of Public Health (CDPH) approve the program for the Food Service Sanitation Manager Certificate (FSSMC) license. 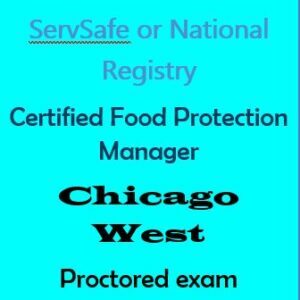 In addition to Illinois, this program satisfies public health requirements in Wisconsin and Indiana – with the ANSI-CFP certified ServSafe or National Registry of Food Service Professionals (NRFSP) examination that follows. The course meets at the Chicago Marriott Hotel Medical District 625 S Ashland Ave, (near CTA blue & pink lines). $10 discounted hotel parking is available as well. We begin at 10 a.m. both days, and end with the proctored licensing examination either at 1:00 p.m. or 4:00 p.m. on the second meeting.